When I was shopping at Shop N Save at Tampines Mart last week, I realised that the prices of almost all items have gone up tremendously. Even the 3-1 Milo pack (my children reminded me to replenish it) has gone up in price. This led me to compare the prices between Milo and Ovaltine (as I used to substitute Coke with Pepsi)…Ovaltine is cheaper by about 50cents and comes with a free premium game! After I reached home, I started to think – Ovaltine or Milo, which is ‘older’? I mean which product was marketed first? I remember when I was very young and staying with my Godmother’s family at Beatty Road, she used to make ‘O val tin Kar Dan’ (Cantonese) for me, which is breaking an raw egg into a cup of very hot Ovaltine. My first contact with Milo was maybe in mid Primary (probably Pri. 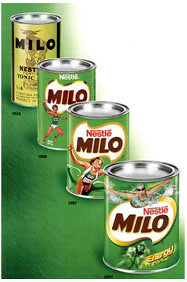 3 or 4), when I was told to draw a tin of Milo and color it with poster color. So I guess should be Ovaltine first then Milo….hehe. How It Started : In 1865, George Wander set up his own laboratory in Bern (Switzerland) . There he produced a malt extract which for decades was to provide a vital food supplement for children and sick people. When he died, his son Albert, a pharmacist and chemist, worked to improve the product, adding other natural energizing ingredients to the malt extract. 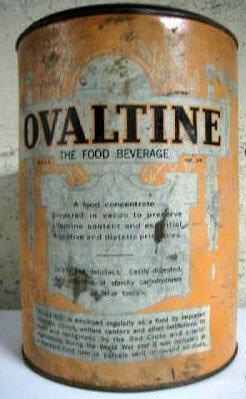 In 1904, Ovaltine was born. Invented by George Wander originally as “Ovo-Maltine” in Switzerland – a fortified barley powdered egg malted-milk beverage. 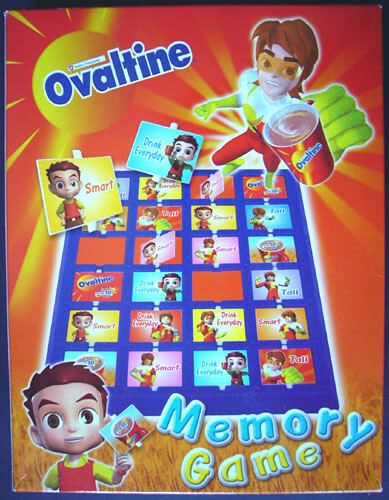 His son’s Albert had it produced in Britain but the British spelt it wrongly and thus the name “Ovaltine”. It was later that cocoa was added to it and thus the current Ovaltine! Read more about it here. 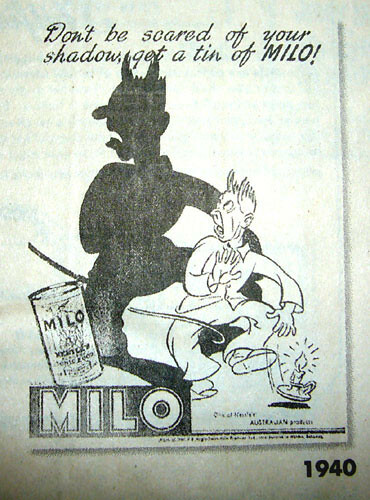 Meaning of Name Milo : Derived its name from MILON (600 BC), a champion athlete of ancient Greek mythology. He was renowned for his feats of strengths. How It Started : Invented by Thomas Mayne, an industrial chemist working at a Nestlé factory in Australia. The product was launched in 1934. 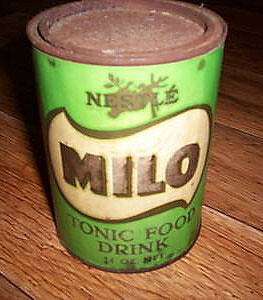 Many uses of such Ovatine and Milo tins such as storing of money as ‘piggy bank’. 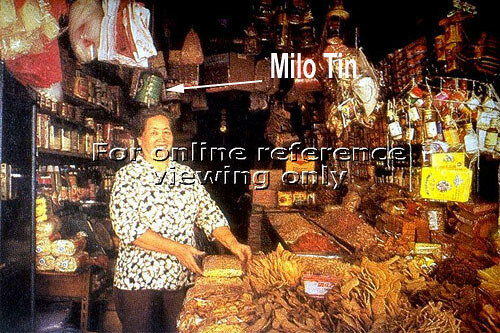 The Milo tin was usually used as kinda ‘cash register’ in some old shops. 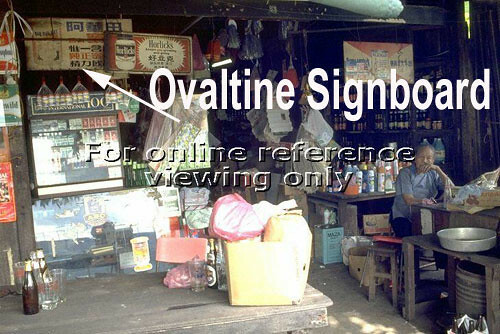 Now both Ovaltine and Milo have undergone many changes in packaging, product types and taste as well. 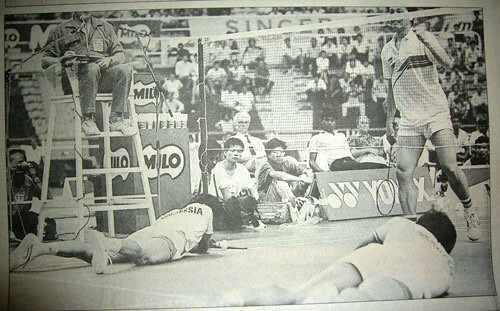 It seems that Milo are more aggressive in advertising especially in the sports arena as you can see on the Milo tin itself. 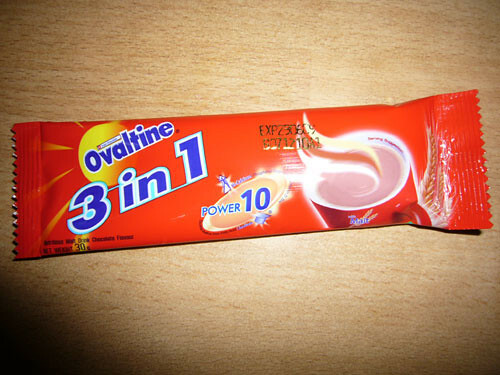 Did Ovaltine still comes in tin form now??? So which one do you prefer Ovaltine or Milo? My kids prefer Milo – don’t know why? 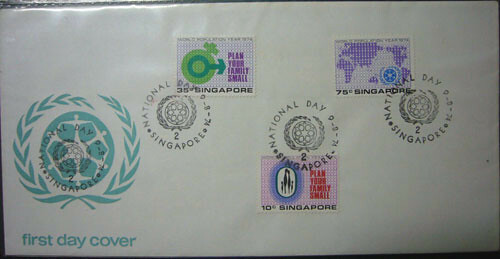 The above was the First Day Cover issued on National Day in 1974. What’s so special about it then? It’s probably one of the most popular campaign in the 70s. Do you still remember this popular logo of the 70s? That’s the Family Planning logo! So what’s Family Planning all about and the changes from the past till now. All the while I thought Family Planning only started in the 70s when the Singapore population was dropping then. At that time there wasn’t such a thing as Internet for me to check it out haha. All that we saw are those Family Planning posters and TV or Radio ads. 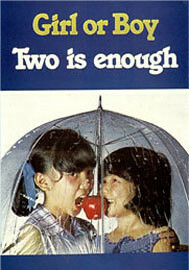 This one with the phrase “Girl or Boy, Two is Enough” – this was the most popular phrase in the 70s. 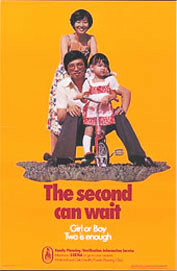 “The Second Can Wait” – this one was for those who were married and probably telling them that the second child can wait, no need to rush for it. This one probably was probably asking couples not to rush into marriage. 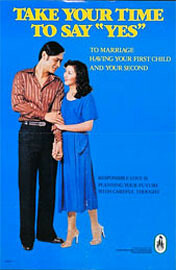 Look at the age of that couple in the poster…still wait…. What a contrast compared to now! In the 70s, the government was advising the people to “Stop At 2”, that’s try not to have more than 2 children per family. Why? 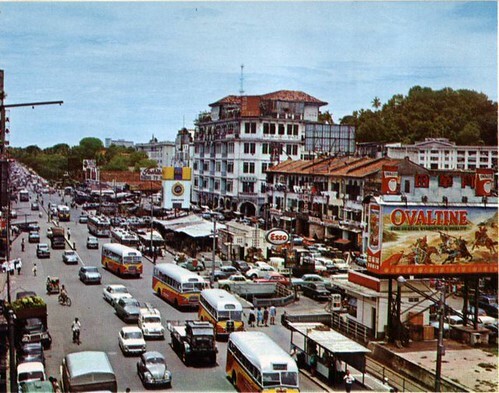 In 1965, on the average 1 baby was born in Singapore every 11 minutes. Check out this link here. So birth rate already started to fall since 1957 to 1970. I remember there was such policies as “population disincentives” for couples having 3 or more children. You may read about it here too. So all these were very contrasting to our current “Have 3 or more if you can afford it” and tax incentives for more children. Why the 180 deg. change in policy? Probably due to the very successful implementation of the first Family Planning campaign. You may take a look at Singapore population from the past. You may note that in some years, there was negative growth too. It’s rather funny that in the 1966 to 1968, Singapore is consider over crowded with a population of almost 2 million then in an area of just over 2 hundred square miles. But now, though we have reclaimed lots of land from the sea, what population are we aiming at? 6.5 million? Besides Singapore, Hong Kong also facing the same population boom in the 60s and 70s. Below are some interesting TV ads from Hong Kong. Interesting right? How I wish to find some of our local ads too..
And before the Singapore Family Planning and Population Board,what do we have? 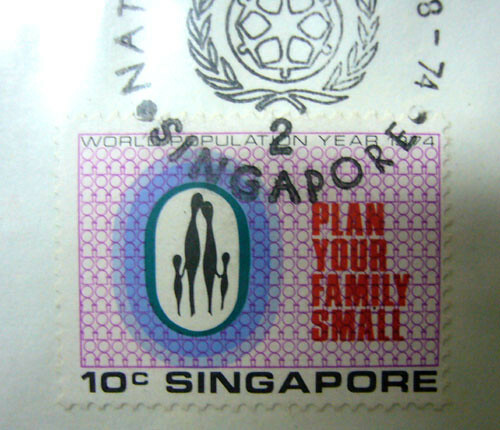 You may wish to read about the Singapore Family Planning Association (FPA) from the 30s to 72. If you were to ask me what’s my National Language when I was in Primary or Secondary school, I may be able to answer you then. When I ask my son (Sec.2) and daughter (Pri.3l) what’s their National Language, guess what they said? I wouldn’t blame them for not knowing. I myself do not know the answer too now! What’s my National Language now? Is it still Malay? 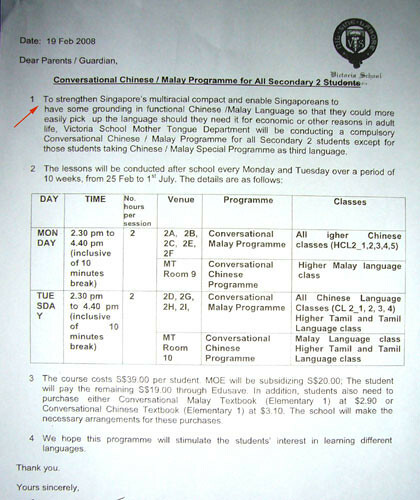 I guess even the teachers or MOE didn’t want to mention or promote Malay as our National Language openly. 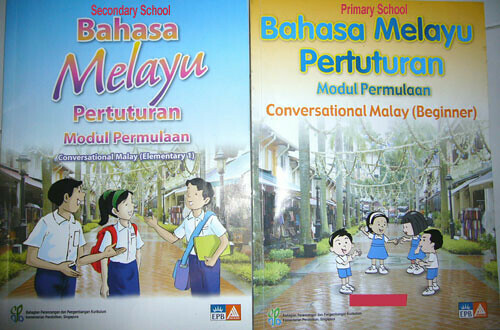 I was taught Malay as a National Language in Primary School and right up till Secondary 1. 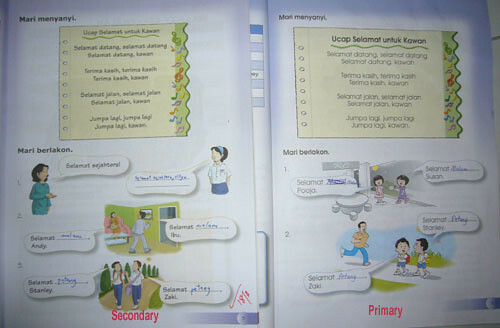 It was even recorded our Report Book as National Language and teachers then told us so too. 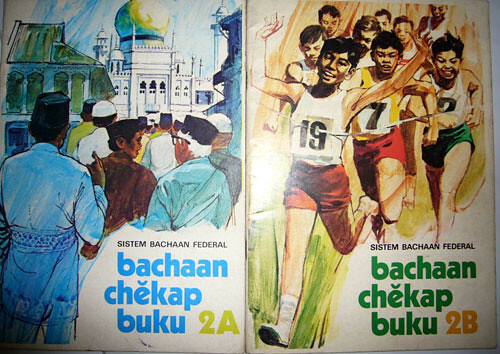 Though Malay was not an examination subject then, it was taught during curriculum time. Yes I’ve blogged about this report book before. Note that both have to pay for the book ourselves though the Primary School one is a free course and non compulsory. My son’s Secondary school said it’s compulsory and have to pay for it ourselves though subsidised and the rest by Edusave. Both are taught outside curriculum time! Total only 10 lessons – approx. 2hrs per lesson per week. See both did not mentioned that Malay is our National Language regardless of what objectives are given. Also see this speech from MOE site. Actually what is taught in Primary School and Secondary School are the same, more or less based on the textbooks they used. 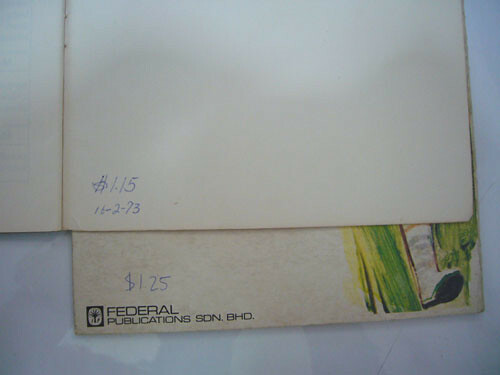 Did you see the difference in the picture illustrations compared to nowadays. Which you prefer? Excuse Me, Do You Sell Tracing Paper? She hurried off to ask another more elderly salesgirl. Together they showed me to a shelf where it was. 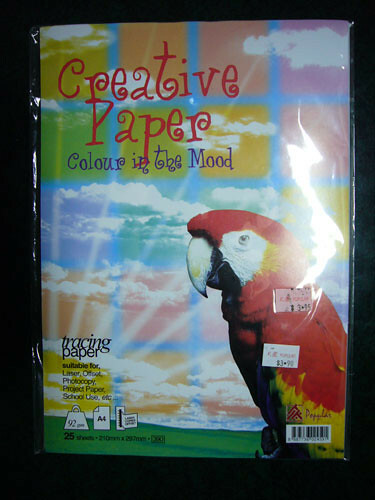 I’m rather surprised that the younger generation like my kids (Primary 3 girl and even my Sec.2 boy may not know), do not know what tracing paper are. Some do know about carbon paper. The tracing paper now is a bit too thick compared to the past. Of course, the prices have gone up many folds too. 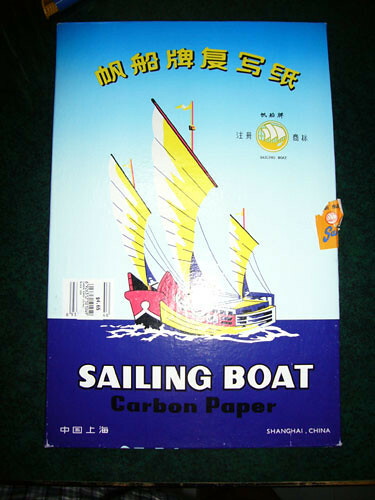 The carbon paper was usually of the brand Pelikan (not too sure the spelling) in the past and they are usually used for typing and those receipts and invoices. I used the tracing paper mainly for my Geography lessons in the 70s – tracing countries maps. 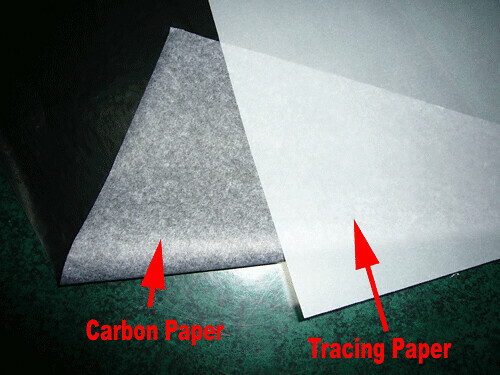 With digital cameras, scanners, Photoshop software, etc.. and many modern technology, all these tracing and carbon papers are seldom used nowadays. So many younger generations may not have seen or heard about it, can’t blame them. Let me try to show you how I used the tracing paper and carbon paper in the past. 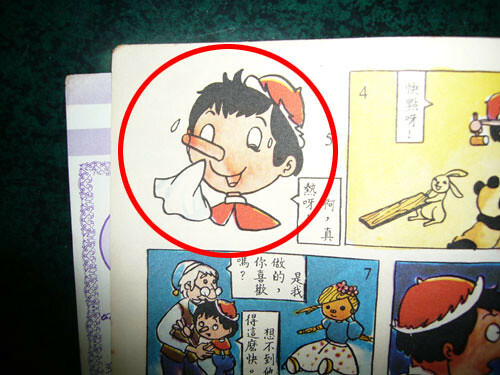 Below is an example of me trying to trace Pinocchio from a book onto a piece of paper. Unless one can draw very well, otherwise, this is what I will do. So do you still use the tracing and carbon paper?